There are several different methods of concrete cutting for different situations. Let’s learn some more about them. Concrete has served humanity well throughout history. That’s because this material can be used to create long-lasting roads and structures that don’t need much maintenance despite the march of time. Still, there are several different methods of concrete cutting for different situations. Let’s learn some more about them. 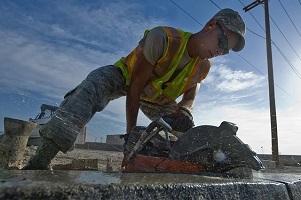 During their next job, your workers might encounter solid concrete slabs. It is possible to saw through them and work with them, but it requires a high degree of caution. This type of concrete cutting is also known as flat sawing or road sawing. Whenever a structure is being repurposed into something else, that’s when concrete slab cutting comes into play. This is where new water lines, sewer lines, and power lines are added to an existing building. Although it might be tempting to use jackhammers to get the job done, concrete slab cutting is much more efficient. The next type of concrete cutting that you will likely need to complete is wall sawing. Wall sawing involves the process of cutting holes through concrete walls for windows, doors, archways, and so on. This process can also create openings that make it easier to install a commercial or residential HVAC system. However, this equipment demands precision and expertise, so it’s best to call the professionals at G&M Services when you need this to be done. There is a third type of concrete cutting, known as wire cutting or wire sawing. During the wire sawing process, diamond-edged wires are used to cut larger objects down into smaller ones. This makes them less problematic to deal with; the wires can also make deeper cuts than conventional saw blades can. To complete wire cutting, you will need a steady supply of water. Handheld saws are another tool that your workers will commonly need to use. These saws can cut through cinder blocks. They excel at creating small openings and shaving off excess material because they only bite into the concrete to a depth of about six inches. Gas and electric chainsaws can also make concrete cutting much easier. However, their use will depend on the environment in which you are working and how breathable the air is. This entry was posted on Friday, January 18th, 2019	at 2:11 pm	. Both comments and pings are currently closed.